1. Park on a level surface and apply the parking brake firmly. 2. Shift the shift lever into P (Park). 3. Activate the hazard warning flasher. 4. Remove the wheel lug nut wrench, jack, jack handle, and spare tire from the vehicle. 5. Block both the front and rear of the wheel that is diagonally opposite the jack position. To prevent vehicle movement while changing a tire, always set the parking brake fully, and always block the wheel diagonally opposite the wheel being changed. We recommend that the wheels of the vehicle be blocked, and that no person remain in a vehicle that is being jacked. 6. Loosen the wheel lug nuts counterclockwise one turn each, but do not remove any nut until the tire has been raised off the ground. 7. Place the jack at the front or rear jacking position closest to the tire you are changing. Place the jack at the designated locations under the frame. 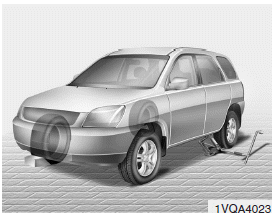 To reduce the possibility of injury, be sure to use only the jack provided with the vehicle and in the correct jack position; never use any other part of the vehicle for jack support. 8. 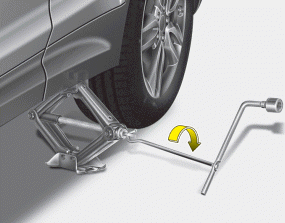 Insert the jack handle into the jack and turn it clockwise, raising the vehicle until the tire just clears the ground. This measurement is approximately 1.2 in (30 mm). Before removing the wheel lug nuts, make sure the vehicle is stable and that there is no chance for movement or slippage. 9. Loosen the wheel nuts and remove them with your fingers. Slide the wheel off the studs and lay it flat so it cannot roll away. To put the wheel on the hub, pick up the spare tire, line up the holes with the studs and slide the wheel onto them. If this is difficult, tip the wheel slightly and get the top hole in the wheel lined up with the top stud. Then jiggle the wheel back and forth until the wheel can be slid over the other studs. Wheels may have sharp edges. Handle them carefully to avoid possible severe injury. Before putting the wheel into place, be sure that there is nothing on the hub or wheel (such as mud, tar, gravel, etc.) that prevents the wheel from fitting solidly against the hub. If there is, remove it. If there is not good contact on the mounting surface between the wheel and hub, the wheel nuts could come loose and cause the loss of a wheel. 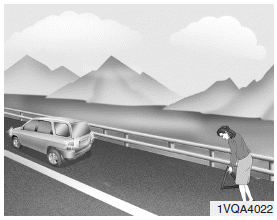 Loss of a wheel may result in loss of control of the vehicle. This may cause serious injury or death. 10. To reinstall the wheel, hold it on the studs, put the wheel nuts on the studs and tighten them finger tight. The nuts should be installed with their tapered small diameter ends directed inward. Jiggle the tire to be sure it is completely seated, then tighten the nuts as much as possible with your fingers again. 11. Lower the car to the ground by turning the wheel nut wrench counterclockwise. Then position the wrench as shown in the drawing and tighten the wheel nuts. Be sure the socket is seated completely over the nut. Do not stand on the wrench handle or use an extension pipe over the wrench handle. Go around the wheel tightening every other nut until they are all tight. Then double-check each nut for tightness. 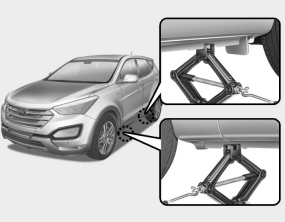 After changing wheels, have an authorized HYUNDAI dealer tighten the wheel nuts to their proper torque as soon as possible. If you have a tire gauge, remove the valve cap and check the air pressure. If the pressure is lower than recommended, drive slowly to the nearest service station and inflate to the correct pressure. If it is too high, adjust it until it is correct. 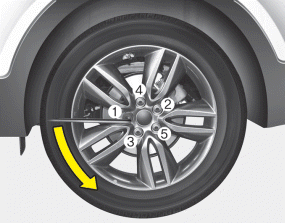 Always reinstall the valve cap after checking or adjusting tire pressure. If the cap is not replaced, air may leak from the tire. If you lose a valve cap, buy another and install it as soon as possible. After you have changed wheels, always secure the flat tire in its place and return the jack and tools to their proper storage locations. Your vehicle has metric threads on the wheel studs and nuts. Make certain during wheel removal that the same nuts that were removed are reinstalled - or, if replaced, that nuts with metric threads and the same chamfer configuration are used. Installation of a non-metric thread nut on a metric stud or vice-versa will not secure the wheel to the hub properly and will damage the stud so that it must be replaced. Note that most lug nuts do not have metric threads. Be sure to use extreme care in checking for thread style before installing aftermarket lug nuts or wheels. If in doubt, consult an authorized HYUNDAI dealer. If the studs are damaged, they may lose their ability to retain the wheel. This could lead to the loss of the wheel and a collision resulting in serious injuries. To prevent the jack, jack handle, wheel lug nut wrench and spare tire from rattling while the vehicle is in motion, store them properly. 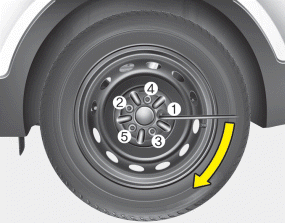 Check the inflation pressures as soon as possible after installing the spare tire. Adjust it to the specified pressure, if necessary. Refer to “Tires and wheels” section 8.